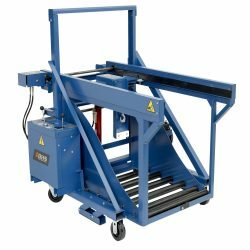 This fully powered Battery Transfer Carriage features a hydraulic operated extractor arm. Raising and lowering is accomplished with a center-mounted hydraulic cylinder. Each function is controlled by a manual control valve with overload relief for additional safety. Power is supplied by a 12-volt DC hydraulic power unit. Lift range is from 5.5 inches to 21.5 inches (140 millimeters to 546 millimeters). Call +1 314 423 2075 to find your nearest dealer. Extends extractor arm reach an additional 7″ (178 mm). Ideal for use with trucks with outriggers.